"John McCain's campaign manager and Freddie Mac essentially had a secret half a million dollar lay-a-way plan. For almost three years, they made secret, monthly payments of $15,000 to Rick Davis for apparently no other work than for him to provide special access to a future McCain White House in exchange. If McCain knew about this, his presidential campaign should be over. If he didn't know about it, he ought to fire Rick Davis immediately." Oh my Gawd, that's sooooo Mavericky! Ah, but he was a POW. So we can't ask him about it. Question: "Gov. Palin, what are your thoughts regarding Rick Davis, your campaign manager, selling access to your ticket for a secret $30,000 a month?" Answer: "In what respect, Chaaarlie?" Davis took a leave from Davis & Manafort for the duration of the campaign, but as a partner and equity-holder continues to share in its profits. But this is Clinton's fault! 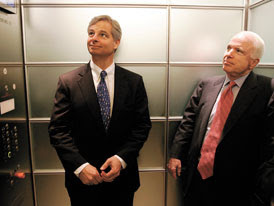 McCain/Palin are going to lead us to that magical tax-free life of prosperity, right brainstems? I can't wait to read stories of your job losses and desperation come 2009. No matter who wins. I may even go to those white trash heartland states like Ohio and laugh at the guys in the unemployment line. give it a break. Do you really think the democrats are any different? They have stood by, especially over the last two years when they had control in congress (don't give me the "don't have veto over-ride control" BS) and let everything happen. This is the type of stuff that needs to be investigated. The FBI needs to dig into fannie and freddie and follow the money trails and do it now before the elections. It would only stand to reason that there will be more democrats implicated in such investigations as they are the ones who control congress and the committees. Fiscal budget restraint is ON the table. Defense cutbacks are OFF the table. Political kickbacks are UNDER the table. Lobbyist manipulation of Federal Policy is BEHIND the 'players' AT the table. National Debt is hanging OVER the table. Political blame-game is TURNING the table. "give it a break. Do you really think the democrats are any different?" Why don't the "anonymous" posters take the time to get a Google identity? Some of you remind of the kid in 8th grade who shot spit balls from the back of the class all year long. He was doing the same thing in 10th grade. He didn't make it to the 12th grade. A bunch of high school rejects. Now that's low. Use the $700B to place an order for 50 million Made-in-USA electic cars to be delivered within 5 years to be repaid by a 5% federal 'green tax'. rip on mccain all you want (he deserves it) but he often shows more "action initiative" than obama does. Take today's decision by mccain to suspend his campaign in order to work on the bailout fiasco. I am surprised that obama didn't think of doing this before mccain. making a decision like this shows the ability to think on your feet and move with the dynamics of the situation. To fault mccain i would say "what took you so long?" "I may even go to those white trash heartland states like Ohio and laugh at the guys in the unemployment line." You can't afford to. You've already posted that you'd leave the country if you had the money. How are you going to get to Ohio if you can't get out of the US? OMG not the "get a fake name so you can be a real person" sh*t again. That way we can argue, fake person to fake person. Doh! that is too complex for the simple liberal mind to comprehend. ha ha, love obama's comment about mcloser wanting to delay the debates so that he can focus on doing his job (a senator) because the crisis at hand needs his full attention. Obama's reply? "A president needs to be able to do more than one thing at a time, now stop asking me questions so I can get back to preparing for the debate". Too bad obama doesn't see that is is important that he focus on DOING HIS CURRENT JOB before trying to get the next.